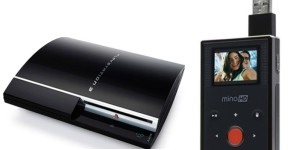 Simply plug the device into one of the PS3’s USB ports via the Mino HD’s flip out USB connector, and any videos stored on the camera show up in the PlayStation’s XMB User Interface under ‘Video’. From there it’s just a case of selecting the video you want to watch and hitting play. No need to worry about cables, networking or transferring files to the PS3 beforehand. Instead, you can pretty much instantly watch your home made movies on your High Def TV via the PS3 (unedited of course, unless you’ve saved your final edit back onto the camera’s internal flash drive). Hat tip: I discovered this feature after talking to a PR rep from Western Digital who make their own High Def media player. Apparently, the Mino HD and the WD TV HD Media Player (review coming soon) also play nicely together. After the latest PS3 Update, it no longer supports footage from the Flip Mino HD. Bummer!!!! !